I eat oats almost every day. Old- fashioned oats, steel cut oats, quick cooking oats; I like them all. Sometimes I even grind up oats in my high speed blender and turn them into flour to create baked goods. The fiber in oats, a great deal of which is soluble (absorbs liquid) has been shown to help lower total and LDL cholesterol levels and to reduce the risk of heart disease. Overnight oats are a great way to get a head start on breakfast. You can make cold versions by soaking oats and other ingredients with milk or yogurt but at this time of year I like to throw my oats in the slow cooker and have a nice hot breakfast ready when I get up in the morning. Here are a couple of slow cooker oatmeal recipes that I love. These recipes make 2 servings each. I have a small slow cooker (1 quart) that I use to make this amount. If you only have a larger slow cooker you may want to multiply the recipe by 2 or 3 to make sure it doesn’t burn. Add all ingredients except cherries to crockpot and cook overnight on low heat. Just before eating stir the cherries in. You can top this with coconut, almonds, and your choice of milk. Combine all ingredients in crockpot. Cover and cook on low heat for 8 hours. The cinnamon will rise to the top so stir thoroughly before serving. One kind of oats that I never buy are the packets of flavored instant oats. While they may be convenient they often have too much sugar and other ingredients I’d rather avoid. You can save money and control what you put in your body better by buying the big tub of plain old fashioned or quick cooking oats and adding your own fruits and flavorings. There is no magic to “instant” oats. I get good results by cooking 1/2 cup of old-fashioned oats and one cup of water in the microwave for 90 seconds. Here’s a tip to control portion sizes. Keep a measuring cup (1/2 cup size) in the oat container so you always serve yourself just the right amount. I love the flavors of curry but oddly enough, I did not make an actual “curry” until just last year. In India “curry” refers to a stew like dish that can be made with almost any kind of meats and/or vegetables and is flavored with a number of highly aromatic spices; which Indian cooks blend themselves. For these recipes I used a curry powder from the spice shelf at the grocery store. It’s a blend of cumin, coriander, chili powder, and turmeric, among other spices. This was the first recipe I tried several years ago using curry powder and one that I still enjoy today. It comes from chef Dave Lieberman and can be found on the Food Network website. Fluff up the couscous with a fork. Add the olive oil, scallions, parsley, lemon juice, and walnuts. Stir around until everything is distributed evenly throughout the couscous. Make up to 2 hours ahead of time and keep at room temperature until you’re ready to serve. Check the seasonings just before you serve the salad and add salt and pepper, to taste. * Couscous is a pasta and there are two varieties. The Israeli variety looks like small pearls. The quick cooking variety is more common in the grocery store and resembles Cream of Wheat or corn meal. 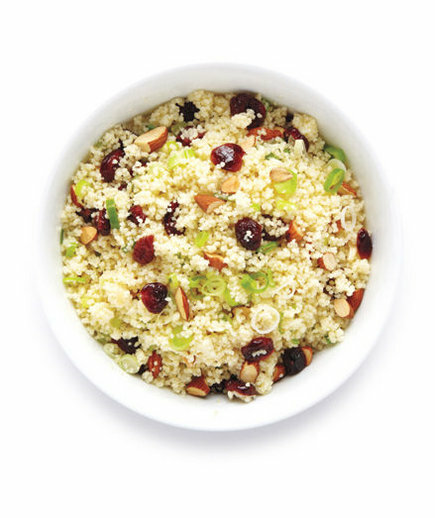 Like all pasta, couscous can be made with either refined white flour or whole grain flour. Read labels carefully if you are looking for a whole grain product. A few years ago we offered the Tufts University “Strong Women Healthy Hearts” class here at the hospital. Part of the class was spent in the kitchen teaching participants how to cook healthier meals and this recipe was included with the curriculum. I’d never considered adding curry powder or fruit to a tuna salad before but believe me, it works. I’ve even replaced the tuna with chickpeas to make a vegan version on occasion. Break up pieces with a fork. Mix in mayonnaise, add remaining ingredients, mix again. Serve on bread or lettuce leaves. Makes two servings. The American Heart Association recommends a couple of servings of fish each week and this is a tasty way to get it. So last but not least, here’s a typical curry dish. I used this recipe from Elise Bauer of Simply Recipes. I added the last of a bag of green peas and did not use any cilantro. I also throw in a few large handfuls of fresh spinach near the end of the cooking time. I served this over brown rice. Isn’t it pretty? Hope this post encourages you to give curry a try!